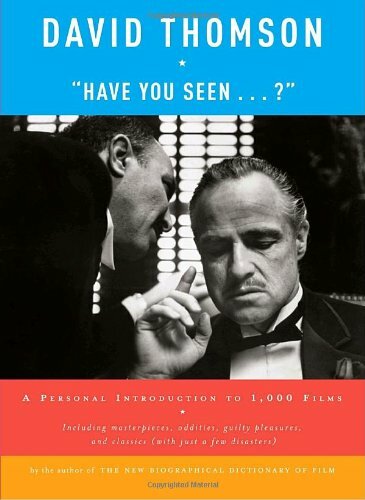 David Thomson's Biographical Dictionary of Film has become an essential reference guide, as well as a great discussion-starter, and now he has followed it with this entirely new, slightly more manageable book, "Have You Seen . . . ? ": A Personal Introduction to 1,000 Films. Very simply, it's a collection of "reviews" of 1000 notable films, consisting of about 1000 words each, one per page, in alphabetical order. It's very often playful; he begins with Abbott and Costello Meet Frankenstein because it looked better aesthetically than Abe Lincoln in Illinois. It's personal; he lavishes gorgeous prose on his pet favorites (To Have and Have Not, Celine and Julie Go Boating, etc.). It's historical; many entries come with some fascinating behind-the-scenes tidbits. It's controversial; not every entry is a glowingly good review. And it's fresh; he manages to cook up readable entries on such heavily covered classics as Citizen Kane and The Godfather, as well as some obscurities that deserve more attention. The most current entry is a Swedish comedy, You, the Living (2007), that didn't find U.S. distribution until a year after this book was published. Thomson's style is smart and dry, but not overly academic. He's often poetic and passionate in his own way, and like the "Dictionary," this one is compulsively readable. It comes with an chronological index of the films as well.